Baked avocado egg is the perfect keto and paleo breakfast. Baked avocado is so creamy! This dish is also substantial enough for a meatless dinner. Baked avocado egg is the perfect breakfast. It is healthy, filling, keto and paleo. It’s also a gorgeous looking dish. I like to serve it when we host for brunch – everyone raves about it! Is it OK to bake avocado? Yes! Baked avocado is delicious. If the idea of baked avocado is unappealing, rest assured, baking an avocado makes it exceptionally soft and creamy. It also enhances its flavor. How do you make baked avocado egg? Scroll down to the recipe card for the detailed instructions. But the idea is simple – you cut an avocado, remove the pit and some of the flesh, making a cavity big enough to accommodate an egg. Pour an egg into each cavity, then bake until the egg whites are set. 1. It’s best to use a large, not too ripe avocado, at room temperature. When you scoop out some of the avocado’s flesh to make room for the egg, make a wide, shallow cavity, not a deep one, to ensure even cooking of the egg white. 2.If your eggs are large, it’s best to separate the yolks from the whites, slide the yolk into the cavity first, and then pour just enough of the whites to fill the cavity. 3. Sometimes the yolk develops an unappealing thin crust after you bake the avocado egg for 15 minutes. When this happens, I very carefully remove the thin crust, using a small sharp knife. The pictures you see here were taken after I removed the crust from the egg yolk. So as you can see, it’s possible to remove the crust while leaving the egg yolks intact. Are eggs and avocado good for you? Yes. I believe that this is a very healthy recipe. Eggs are very nutritious, and research shows that they actually improve cardiovascular health markers. and avocado is high in fiber and in antioxidants. How to serve this dish? While it may seem like baked avocado egg practically begs to be eaten with toast, if you’re on a low carb diet, it’s just as good eaten with utensils. I scoop out the avocado flesh and baked egg using a spoon, then eat it with a fork. But if you really want something to use for scooping the avocado and egg out, make this quick microwave keto English muffin, cut it into strips, and use that (similarly to what I do when serving soft boiled eggs – see the photos on that recipe). 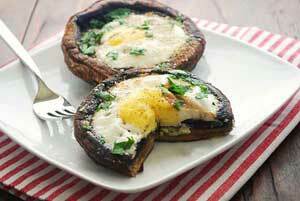 Portobello baked eggs are another perfect brunch recipe. 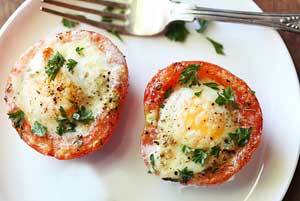 And egg stuffed tomatoes are actually on eof my favorite lunches. Preheat oven to 450 degrees F. Line a small baking dish with parchment paper. Look for a small baking dish that would allow the avocado halves to stand upright. Cut the avocado in half lengthwise and remove the pit. Using a spoon, scoop out a little of the flesh of each avocado half – you want it to be large enough to accommodate a medium egg. Season the avocado halves with half of the kosher salt and black pepper, and place them in the prepared baking dish. Break each egg into a small bowl, then carefully slide the yolk, and as much as will fit from the white, into the center of each avocado half. Bake until whites are set, about 15 minutes. If the egg yolks have developed a thin crust while baking, remove it carefully with a small sharp knife. Season the baked avocado egg with the remaining kosher salt, freshly ground black pepper and red pepper flakes, and garnish with chopped parsley. Serve immediately.